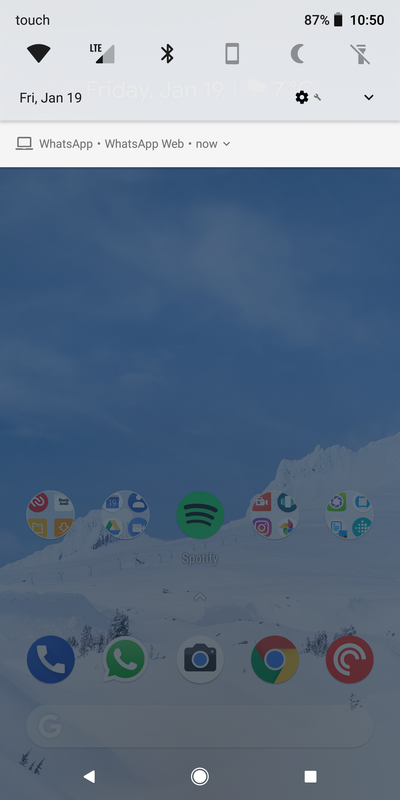 Android 8.0 Oreo introduced one cool feature for app notifications: channels. 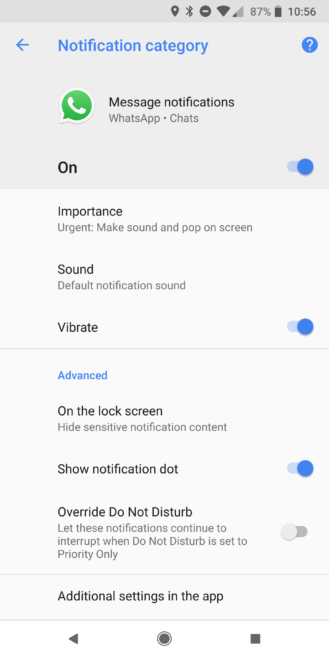 Since not all notifications are created equal, even if they come from the same app, this would allow you to choose how different types of notifications appear, sound, and vibrate, or not, on your phone. 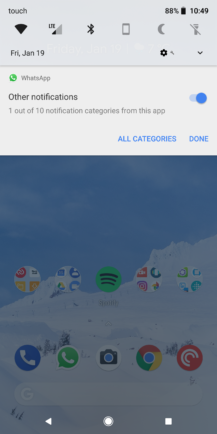 However, that created one big issue: Google didn't have a fallback in place for apps that don't get updated to support the channels, which means that you couldn't assign importance to any notification coming from the app. That, as you can imagine, was very annoying with apps like WhatsApp where you couldn't disable the permanent WhatsApp Web running notification without disabling all of the app's notifications, for example. 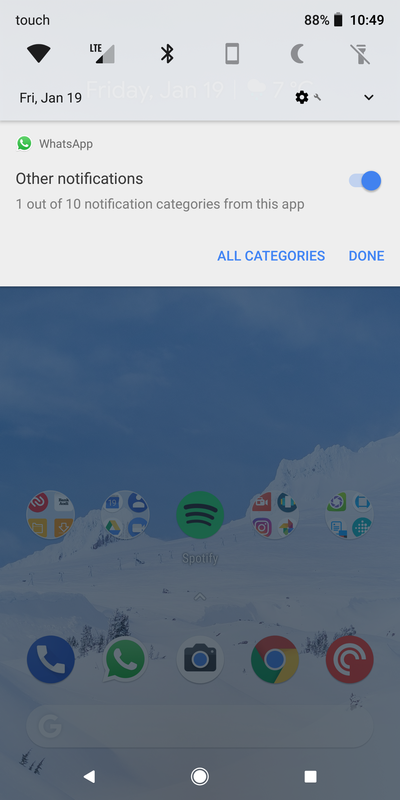 We're not sure when exactly notification channels were added - I checked them a couple of weeks ago and they weren't there - but they're now here. I'm running version 2.18.18 beta (APK Mirror download) and I can see them in the settings, but I can't easily roll back to older versions of WhatsApp to verify in which version they were added. Maybe they just showed up and maybe they've been there for a few days or a week or so. Regardless, I didn't see this reported anywhere and it's worth talking about for those of you who haven't seen them yet. 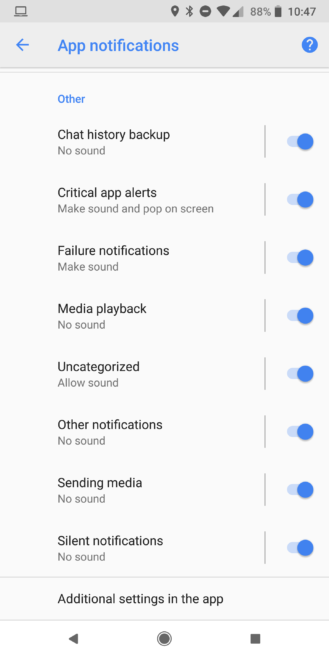 WhatsApp supports 10 notification channels: group notifications, message notifications, chat history backup, critical app alerts, failure notifications, media playback, uncategorized, other notifications, sending media, and silent notifications. 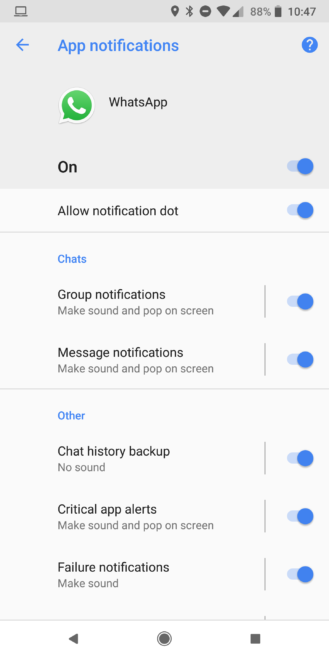 Each of these has multiple settings that can be controlled individually, so you can keep a high importance on your regular messages but put a low priority on group messages for example, and then disable chat backup messages. Settings for the "Message notifications" channel and "Other notifications" channel. 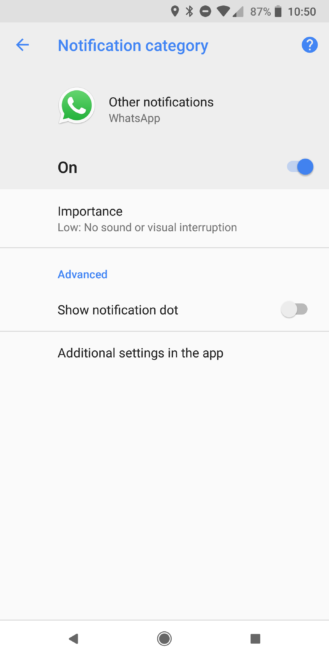 If you're annoyed by a certain type of notification coming from WhatsApp and you don't know which one that is, there's an easy way to manage things. When you see the notification on your device, tap and hold it. You'll see the type there and you can instantly disable it. However, if you just want to change its priority, you can tap on All Categories, which takes you to the setting screen above, and you can choose what you want to do with it. 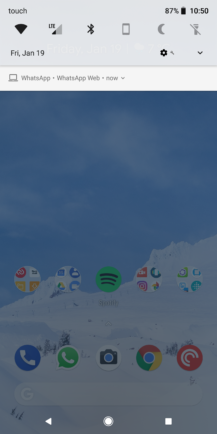 This is especially important to me because I keep WhatsApp Web running all day on my computer, but the picky part of me hates that icon and permanent notification that show up on my phone. 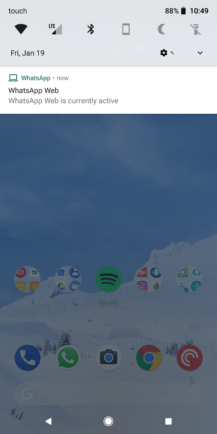 With this, I am either able to disable them completely (it's in the "Other notifications" channel) or put them on low importance so there's no icon and the notification is just a simple line instead of a three-line affair. 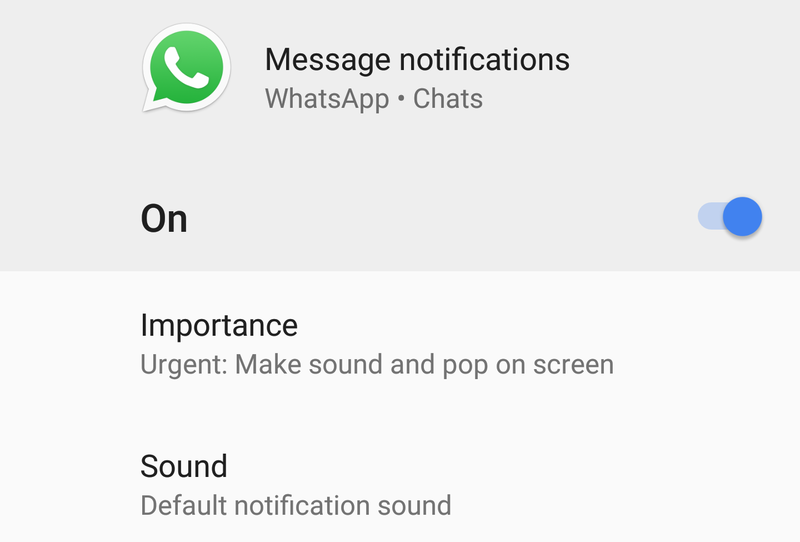 WhatsApp Web notification medium importance (left), tap-and-hold for its settings (middle), and low importance (right). One more thing I'd like to point out, that we haven't covered earlier because it was a small change, is the ability to switch from voice to video during a call. This started rolling out about a week ago in the beta, got removed, then came back a day later. 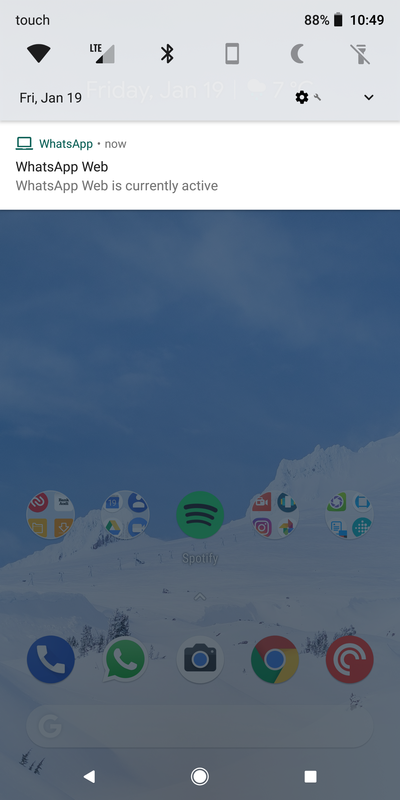 It's there now should you want to quickly hop to a video chat while talking to someone, so you don't have to hang up and call them again on video. When you tap the video button, a request will be sent and they can either accept or reject it. Again, I can't easily go back in WhatsApp versions to know when notification channels were added, but they're there in version 2.18.18 beta which you can get from the Play Store if you join the Beta program or directly grab from APK Mirror. 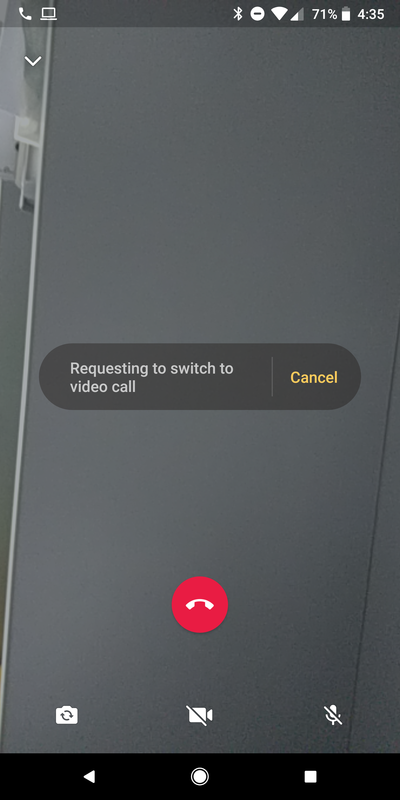 As for switching to a video call, it's been there in the beta for about a week.